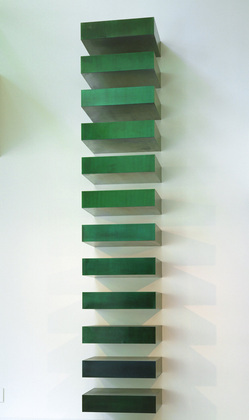 Donald Judd (June 3, 1928 – February 12, 1994) was one of those artists that I didn’t ‘get’ for a number of years. I had walked by his minimalist coloured steel sculpture many times on my way to more interesting parts of the gallery. I don’t recall any specific moment when I began to understand or appreciate him, and am still not sure I do. Minimalism in its extreme form, such as it is with Judd, can challenge our aesthetic sense; it is tempting to see Judd as a sculptoral abstract impressionist or color field painter, but in his own written work he denies that. He even denied his minimalist label, likely because there is too much intentionality in it. He saw his sculpture as representing nothing, not even colour and its relationship to medium. Rather the art should define and take up “real” space and stand wholly for itself rather than be manipulated or made into something. He stressed the industrialized rather than the purely creative process for making his art, and as such can be considered closer to Marcel Duchamp or Dan Flavin than any other artist. P.S. Judd also named one of his sons Flavin, after Dan Flavin who was his friend and whom he admired. Judd was in very many ways doing with steel and colour and later on plywood and Plexi-glass what Flavin was doing with fluorescents. Like so many modern and contemporary artists, Judd and those like him require some context and knowledge to be understood. It is not as simple as staring at a bowl of painted flowers and hoping to “get” it. If you understand Duchamp and Flavin you can get Judd. It also wouldn’t hurt to check out Mark Rothko. 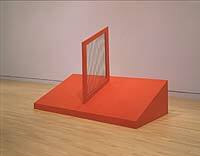 Although Judd denied the relationship of his sculpture to painting, it is fun to compare a Judd to a Rothko or a Jasper Johns or a Barnett Newman. What is so interesting about modern art is to see in which of so many directions that artists began to rocket away from each other and yet keep some essential aesthetic or idea between them. I saw this most clearly at a colour field exhibit exhibition at the Ontario Art Gallery five or six years ago. Every possible medium was employed there, except sound and touch. Rothko on canvas, Flavin with light, Judd with metal, Dewitt with wall scribblings, Motherwell with mixed media, etc, etc. They all had one thing in common. Colour. These thematic exhibition are incredibly useful to help us contextualize modern art, which is the only way that some of it makes sense, denying, or even repudiating, as so much of it does, sensual beauty.